In 1993, DOCTOR WHO was 30 years old, but was no longer being made. The interest in the show was certainly still there, so it was decided to celebrate the anniversary with a special documentary- the grand finale of which was the appearance of the EMPEROR DALEK, as first revealed in THE EVIL OF THE DALEKS, in 1967. I had made my accurate version the year before, and people were so impressed, that it was given special status by having an enormous recreation of the original set made for it. The filming of this (originally intended for another venue) ended up taking place in Studio 8, at the BBC TV CENTRE, in London. This was the studio where shows such as BLUE PETER, and THE TWO RONNIES had previously been filmed, and where incredibly, in 1979, I had seen my first DOCTOR WHO being recorded- DESTINY OF THE DALEKS. Now, all those years later, my own DALEKS were being filmed there! DOCTOR WHO stopped being made there in 1989, when the original 'classic' series was cancelled. Today, even the BBC offices & studio building itself- the famous 'doughnut' complex, is currently up for sale. For this special anniversary documentary- 30 YEARS IN THE TARDIS, the designer assigned to work on it was ANDREW HOWE-DAVIES. 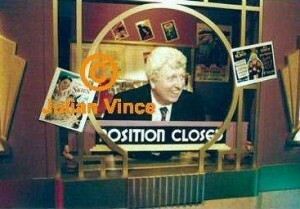 He was a prolific designer who had worked on countless shows, including Channel 4's, FATHER TED. However, the greatest irony was the fact that at that time his assistant was CHRIS THOMPSON, the very man who had designed the EMPEROR and the sets for EVIL OF THE DALEKS, back in 1967! His praise of my work came during filming when he said of my EMPEROR- "It's better made than the one we did!" 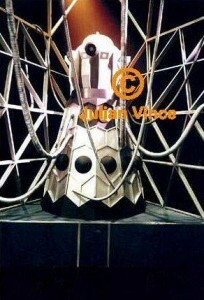 During the set construction (which also included a DALEK corridor, TARDIS set, and a 1960s living room, where ELIZABETH SLADEN was filmed) having completed and placed the EMPEROR on its plinth, I pointed out that there was no tubing anywhere in sight. It had simply been forgotten! So, at 9pm in the evening the call went out and by 10pm a HUGE pile of black tubing had arrived, all of which then had to be sprayed silver and then suspended from the set, so that it was ready for filming the next day. Where the tubing came from at that time of night is still a mystery! The EMPEROR and set became the main attraction, and a thousand photos were taken of it, creating great publicity in magazines as a result, which was all excellent for the promotion of the documentary. But a meeting that was the most rare and special happened within the shadow of the EMPEROR, on the edge of the set. As the production was being made at the BBC, where many programmes were then still being made, word soon reached us that entertainer and actor ROY CASTLE, was filming his show RECORD BREAKERS in one of the other studios nearby. Eventually,he came to visit- just briefly, as he was quite ill by this time, and for both the first and last time he was reunited with his fellow cast members from the first ever DALEK movie, DOCTOR WHO AND THE DALEKS (1965). 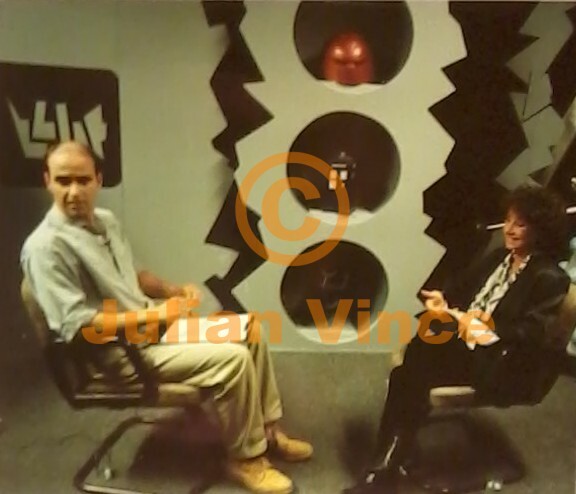 As part of the broad appeal of the DOCTOR WHO series, all aspects had been catered for and both ROBERTA TOVEY and JENNIE LINDEN were already in the studio for their interviews. This allowed their big-screen characters of IAN, SUSAN, and BARBARA to meet up again for this ultimate one-off time. Sadly, this unique occasion was only photographed, but not filmed. Other famous faces invited to the recording included THUNDERBIRDS creator, GERRY ANDERSON with his young son, who were both photographed with the EMPEROR, so making the three days of studio production a very busy and special time. The whole event is something that could not be repeated now. A whole lot of history was in that room during the recording, and it had a special, exciting atmosphere that the pictures don't quite convey! 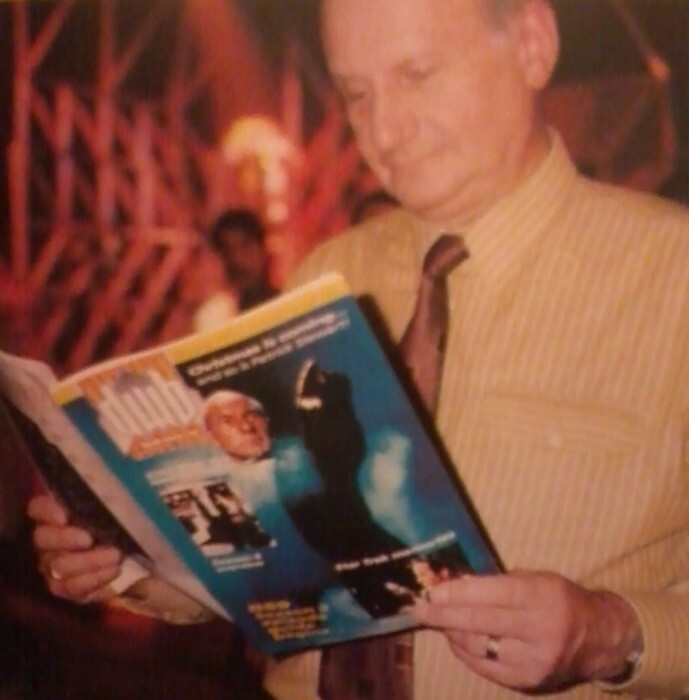 Just a few years later, the EMPEROR made another appearance in a documentary, this time with 7th DOCTOR, SYLVESTOR McCOY, and also DALEK operator legends CY TOWN, JOHN SCOTT MARTIN, NICK EVANS. 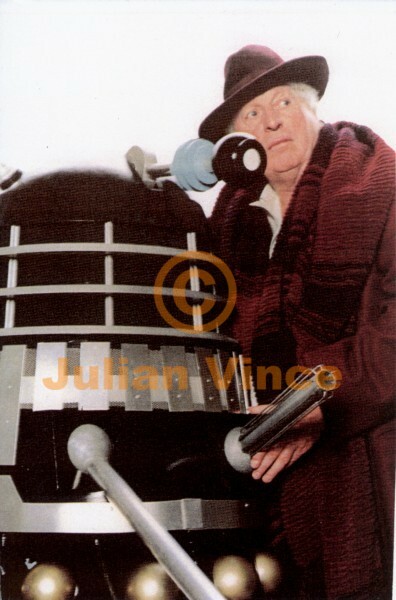 Also there was the original voice of the DALEKS, PETER HAWKINS. He had provided his talents not only to the DALEKS (DEAD PLANET to EVIL OF THE DALEKS), but also to classic children's shows CAPTAIN PUGWASH, THE WOODENTOPS, and BILL & BEN. So, this particular 'KING OF THE DALEKS' has had a busy life since first appearing twenty years ago, in what is now the 50th anniversary year of the series. This unique EMPEROR DALEK prop has had genuine close contact with a lot of people from the world of DOCTOR WHO, and is now a part of it too. 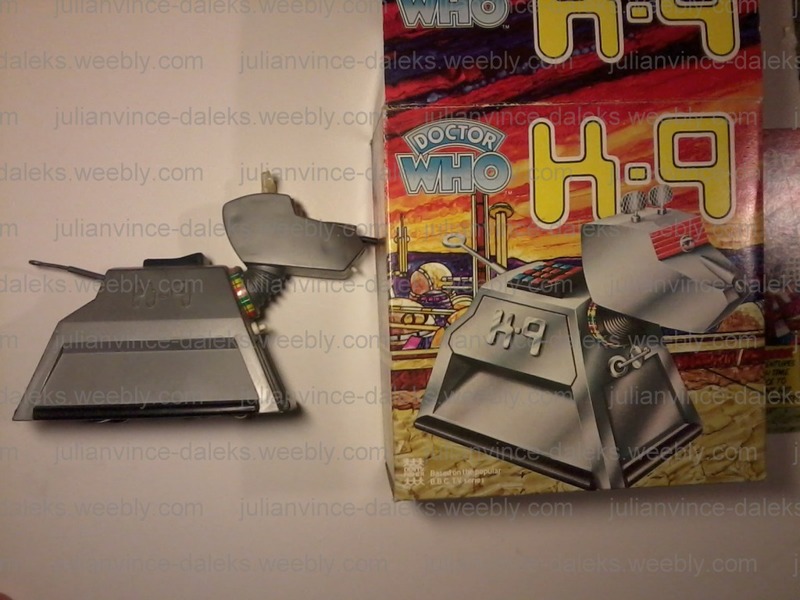 Its half a century since the DALEKS first began, and its new owner should be aware and proud to have an item that also has its own exclusive DALEK history. TOM BAKER is, for a whole generation of viewers, the epitome of who and what DOCTOR WHO represents. No other actor has, or ever will, be in the role of the famous TIMELORD for as long as TOM- an amazing 7 year period (1974-81). His eccentricity, humour, and 'other-worldly-ness' fixed his image as THE ultimate DOCTOR WHO in the minds of millions of people, forever. If it turns out he really is from another planet, and not an actor, nobody would be surprised! His iconic stripey scarf, beaming smile, and booming voice has proved to be the benchmark for all actors who have followed him since- except they have never quite reached it in terms of his appeal and love in the memories and hearts of the British public. Just as SEAN CONNERY is the ultimate JAMES BOND, so TOM BAKER is the ultimate DOCTOR WHO. As a result of his success and longevity in the part, and despite his connections still with the show, he has always steadfastly refused to get back into his famous 4th DOCTOR costume, since he quit in 1981. There have only been, to date, three brief exceptions to that decision. One was for his appearance in charity event CHILDREN IN NEED (1993), and the next for a New Zealand TV advert (1997). It was on this third occasion that I was approached to help out by supplying both a full size Police Box prop, and a BLACK DALEK. Costume designer, JUNE HUDSON, who had previously worked on the TV series and also designed his new burgundy outfit, was present for this special event. The entire photo session made use of the historical OLD ROYAL NAVAL COLLEGE next to the River Thames, London. A buoyant, happy TOM, enjoyed the days photo session to such an extent that he continued to stay for well over an hour longer than he was intended to. So, the car that had been sent to collect him for his next engagement (a voice-over) had to wait until he was done. While he kept us all entertained with his witty remarks and stories throughout this whole event, what made this day so special was the fact that he was in costume- such an incredibly rare thing! It was like having the 4TH DOCTOR in the room, rather than, as is usually the case, having TOM BAKER in his 'civvies'. I managed to get some photos of him with my TARDIS, and wearing a version of his original SCARF, but best of all was seeing him posing with my BLACK DALEK. I stood him in position and posed his hand on the DALEK prop as best I could, to replicate that very famous picture of him from his first ever year as the DOCTOR. 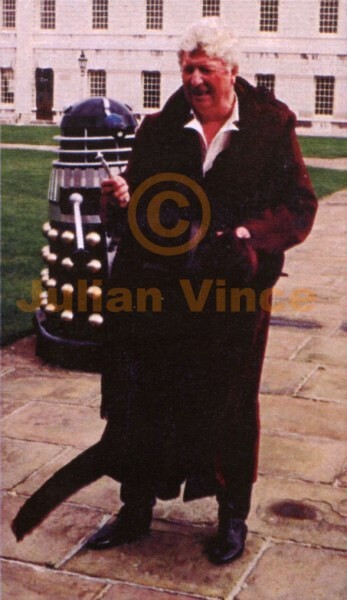 That classic 1975 publicity shot of him standing in the car park at BBC TV CENTRE with the grey GENESIS OF THE DALEKS prop, has proved to be an image that has endured ever since, having been reproduced countless times. So a mere 24 years later, there he stood (perhaps for the last time in costume?) but this time with my BLACK DALEK, recreating that famous moment. 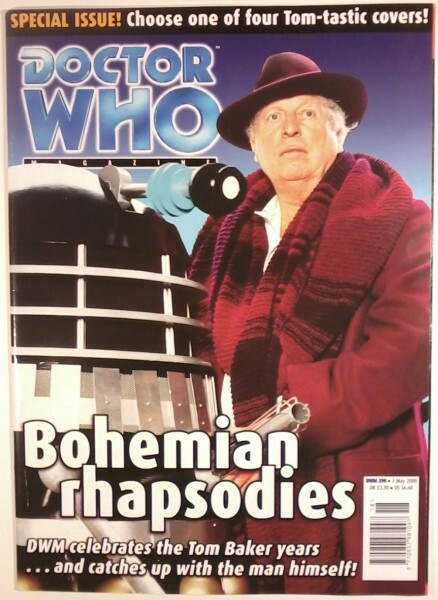 And that particular photo was soon used on the cover of DOCTOR WHO MAGAZINE issue 290. Now the DALEK he is seen posing with is seeking a new owner who will love and look after it. 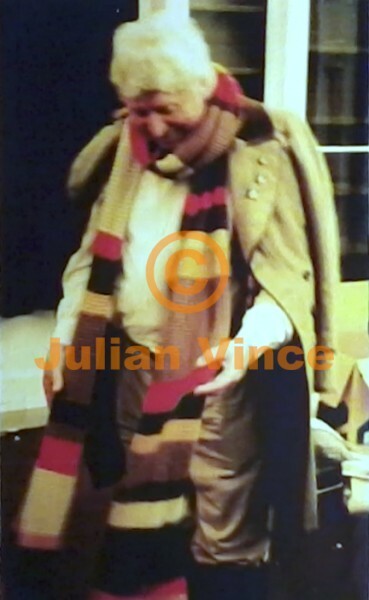 During the busy 1998 photo session of TOM BAKER in his DOCTOR WHO costume, I brought out my reproduction of his most famous scarf design. TOM was happy to put it on and be reunited with an 'old friend', as these photos show. This item is now available. 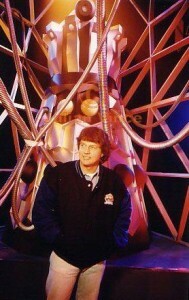 In 1997, I was asked to design and build a special cinema set for series of video-link introductions by TOM BAKER. As I love Art Deco, then it was a double pleasure to design and make the set especially for TOM'S presentations. Many people asked me which old cinema we had gone to, not realising it was a small wooden set! Now, that whole item must go, so is available. 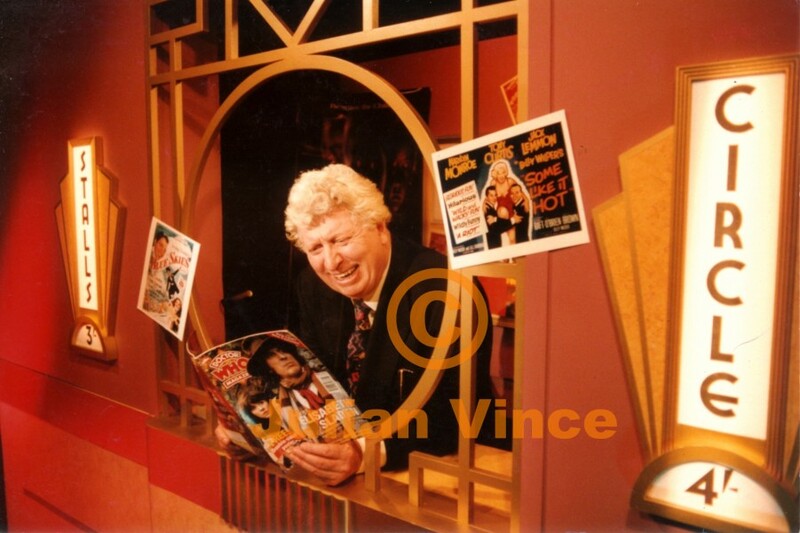 It will come with some photos of TOM BAKER during his video filming with the set. 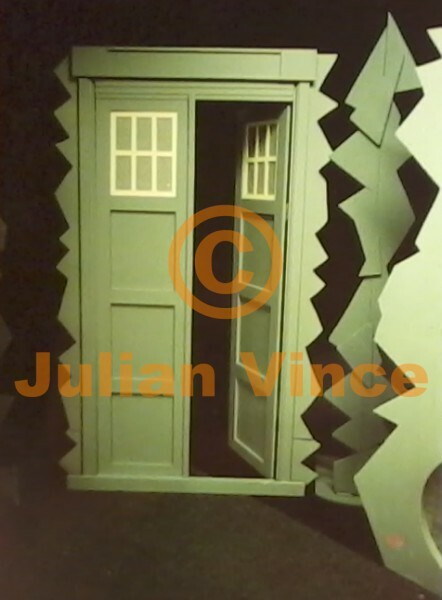 I was commissioned to design and build this unusual DOCTOR WHO set for a series of interviews, 1994. It was initially built to simply be broken up easily when filming was completed, and thrown away. But, it proved so popular when used, that it was kept for a second year and further series of interviews with DOCTOR WHO actors! The atmosphere that this TARDIS set helped to create led to a lot more memories of their time on the series being recalled by the actors and production people. This made for extended versions of these famous interview tapes, which were all presented by NICK BRIGGS, the man behind the voice of the DALEKS in the NEW DOCTOR WHO series (2005 to present). There were many interviews conducted within this set and they included- VERITY LAMBERT, CAROLE ANN FORD, WENDY PADBURY, MICHAEL CRAZE, TERRENCE DICKS, BARRY LETTS, DEBORAH WATLING. The set is now available to someone who will appreciate its history, and with a large sitting room to keep it in! 1977 Palitoy K9 toy with original box. 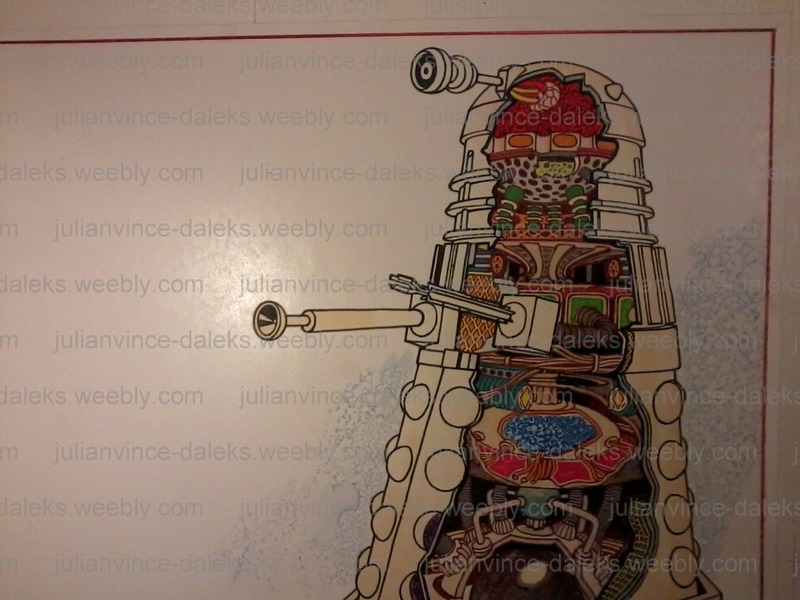 Original Dalek artwork from 1976. 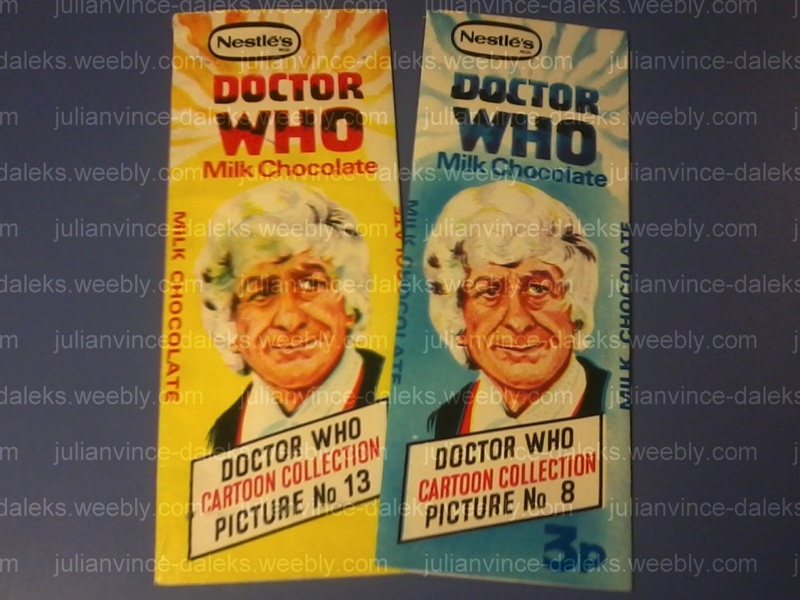 Original 1971 Nestles Doctor Who chocolate bar wrappers, with Jon Pertwee as the 3rd Doctor. 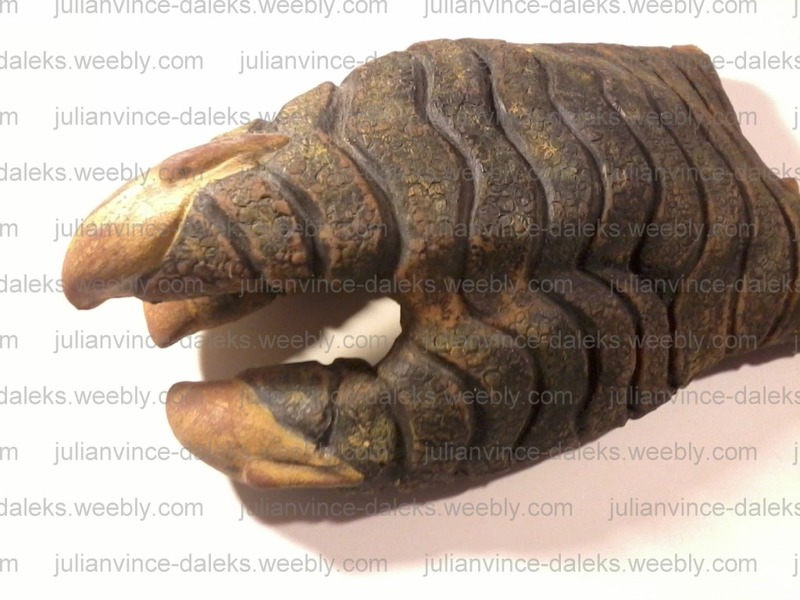 One of the original Yeti claws used in a '90s drama production. It starred Nicholas Courtney as the Brigadier, and Elisabeth Sladen as Sarah Jane Smith. 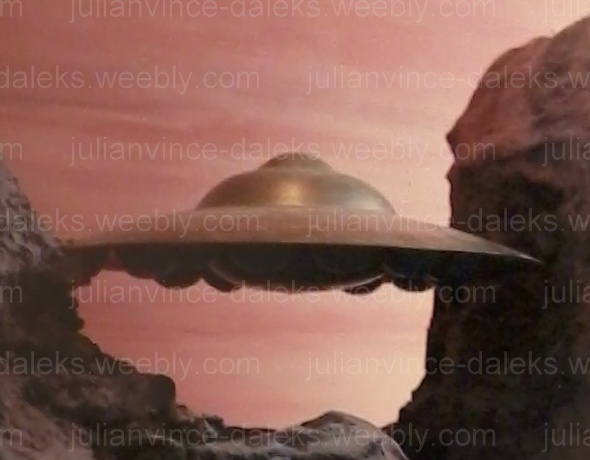 The original Dalek Saucer, as used in the production of the film Mission of the Daleks, 1981. Now available to buy. Ty-Phoo Tea box with Doctor Who promotion. Original Black & gold Dalek badge, 1965. Original silver & red War of the Daleks game piece, 1974.